As the world enters the third decade of the twenty-first century, far-reaching changes are likely to occur. China, Russia, India, and Brazil, and perhaps others, are likely to emerge as contenders for global leadership roles. War as a system-changing mechanism is unimaginable, given that it would escalate into nuclear conflict and the destruction of the planet. It is therefore essential that policymakers in established as well as rising states devise strategies to allow transitions without resorting to war, but dominant theories of International Relations contend that major changes in the system are generally possible only through violent conflict. 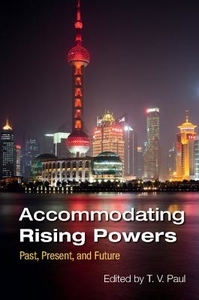 This volume asks whether peaceful accommodation of rising powers is possible in the changed international context, especially against the backdrop of intensified globalization. With the aid of historic cases, it argues that peaceful change is possible through effective long-term strategies on the part of both status quo and rising powers.